We’ve got another data point in with week two in the books, as once again this early in the year there can be a ton of variance in strength of resume since one big win could account for 25% of your schedule. Several teams made moves in week two while others were halted in close losses. For instance, UCLA and BYU made moves into the top three while the teams they beat, UC Irvine and Ohio State, got an early season blemish but remain ranked high. At the very top though, nothing changed with Long Beach State securing their positioning. Long Beach State solidified their top spot in the rankings with two more top 10 victories. They have arguably the best resume early on thus far and have combined it with stellar play as they’ve only dropped one set in six matches. Nine sets played, nine sets won for UCLA thus far in 2018. None of their opponents stick out as being juggernauts, but the fact that they’ve dominated lesser competition is a good thing. They’ll get their first test this week with a pair of fellow southern California teams who are ranked. 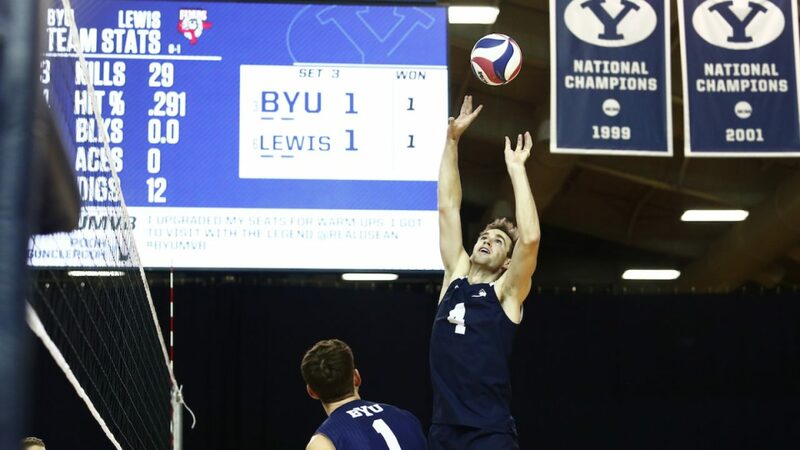 It wasn’t quite the opener that BYU had hoped for, as they were upended in five. They redeemed themselves in the next match against Lewis though as they don’t fall too far in the rankings. Speaking of redemption, they get a chance for some more this week at Ohio State in a rematch of last year’s National Championship that the Buckeyes won. UC Irvine lost a tight match with UCLA after they lost a 2-0 set lead, but took advantage of their bounce-back opportunities with wins over USC and Pepperdine. They’ve now got four top-15 ranked victories with their only loss coming in five on the road to a top-five opponent, giving them a great overall resume. Hawaii has been a dominant team early in the season, racking up top 15 wins over USC and Grand Canyon in sweep fashion. They get a week off now too to grow and get even better. At this point in the season just two weeks in it’s a constant shuffling and re-evaluation of overall resume with so little data points. They aren’t penalized too much for running into the LBSU buzzsaw and now get more credit with BYU’s success. The Buckeyes couldn’t handle a National Championship rematch with BYU, but came so close to doing so with a five set loss. They also scored their best win of the season in downing Stanford, but overall they still have plenty to prove with many new players in the fold. CSUN had a short week with just one match but continued its winning ways by extending their set win streak to 11. They’ll have a more stern test this week both in quality and quantity of opponents but look to be the team to beat in both. The Nittany Lions began their 2018 after not playing in the first week with two solid performances and a 2-0 start. Their first ranked matches though come this week in the Pac-12/Big Ten challenge. Lewis finally got off the schneid with a win over George Mason, but couldn’t handle the top end competition in their first three losing nine of 10 sets to current top five teams. They still have a talented roster but will need to improve to reach the next tier. Saint Francis continued to impress in week two after a 2-2 mark vs. all ranked opponents. Their first big victory over Stanford looks a bit better now after the Cardinal moved up a tad in the rankings as well. Pepperdine had its second straight one-match week although this time it didn’t go as well. They showed some strong qualities and flashes in a loss to a solid UC Irvine team, but will look to get back to their winning ways this week. The Lopes did fall to Hawaii, but the Rainbow Warriors have been fantastic to start the year. Overall they have three wins over teams who were ranked between 17-19 at the time of the match, so their overall resume pushes them up a few spots. USC was supposed to have a two-match week but had its second of the span against UCSB cancelled with the recent mudslides. Instead they fell for a second straight match by losing to UC Irvine, making both of their losses sweeps but to top seven teams. UC Santa Barbara didn’t appear in any matches in week two due to some natural disasters going on in the area. Still, their win over Stanford from week one propels them ahead of Ball State since the Cardinals fell to that same bunch this week. The Cardinal got their first win of the season in impressive fashion on the road against Ball State. That came after they played a tight match with Ohio State on the road too. The biggest piece of it may have been Paul Bischoff‘s return, as the setter made the offense more smooth. Ball State had their first big tests and lost to a higher ranked BYU team followed by one to a lower-ranked (at the time) Stanford bunch in a meeting of Cardinals vs. Cardinal. It’ll be an easier week upcoming, but they are still searching for an early marquee victory. UC San Diego slides up another spot on the week but now will take on their toughest week of the season, headlined by UCLA. If they can show up strong in that as well as the other two, they could rise even more. Through four matches, Fort Wayne has yet to lose a single set. It always hasn’t come against top-end competition, but they scored their best win by taking down Princeton on the road in a sweep to launch into the rankings. Princeton hasn’t had quite the five-match start they envisioned with a surprising sweep at home to Fort Wayne the cherry on top. On the bright side, Junior Oboh returned from injury and they now have a few weeks off to reset.